We received some very sad news this past week. 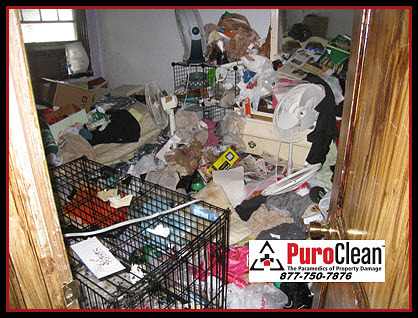 PuroClean Emergency Recovery Services was called several weeks ago by a relative living in another state to assist his aging aunt with hoarding clean up services. 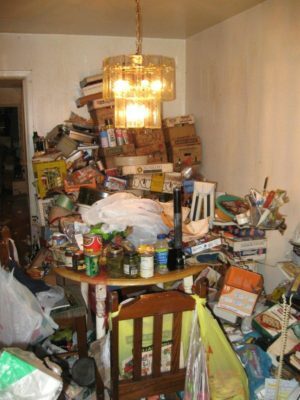 This was a different kind of hoarding clean up than what is normally seen on the television shows (e.g., Hoarding: Buried Alive and A&E’s Hoarding) and what we have seen in our business. 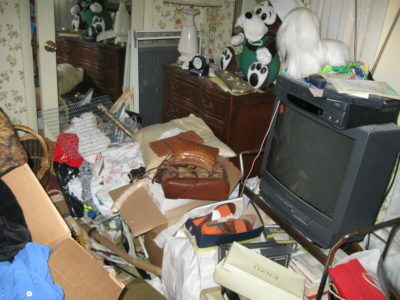 This woman didn’t collect “stuff” from dollar stores, garage sales, or dumpster diving and didn’t own pets. 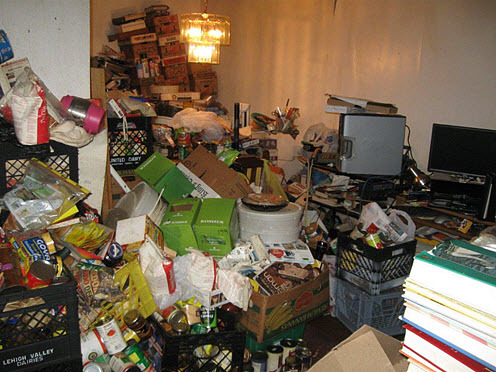 The cause of the hoarding practices occurred thirty years ago when the woman suffered a stroke at age 42. 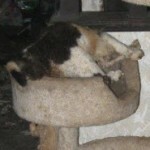 Because her brain had been so damaged by the stroke, she was unable to care for her personal needs. For many years, her beloved husband had provided personal care for her – washing her clothes, cooking her food, taking out the trash, and keeping the house clean. Unfortunately, her husband passed away 8 years ago, leaving this woman isolated and alone. 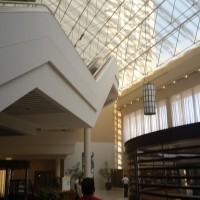 The extent of her disability was unknown to her relatives until they were contacted by the City of Philadelphia. 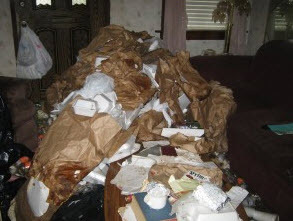 When we went on the initial call, Mrs. B met us on the front porch wearing nothing but a trash bag. 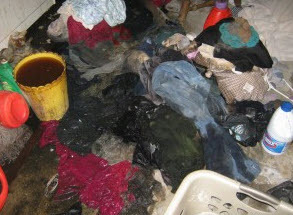 All her clothing had been soiled and she was unable to solve the problem of washing them because the stroke had damaged the part of her brain that controls effective problem solving and information processing. 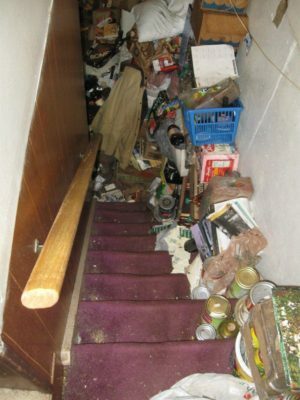 Piles of garbage with empty food containers almost blocked the door because she couldn’t remember where or how to empty the trash. Flies and vermin filled every room because Mrs. B was incontinent of bowel and bladder and human waste coated all the furniture. And, she couldn’t remember how to clean it anymore. With the aid of the out of town family members, and with compassion and gentle caring, we helped Mrs. B to obtain clean clothing. 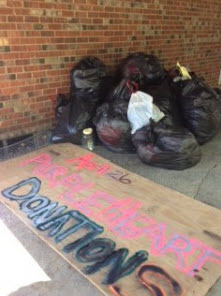 We emptied the home of garbage and human waste. 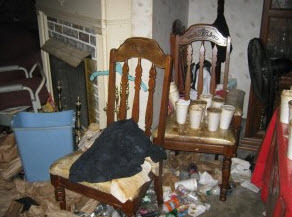 There was still much work to do to finish sanitizing the home, but Mrs. B could only handle a few hours of clean up activity at a time, so we waited patiently until we were allowed to do more for her. Unfortunately, with no family in the local Philadelphia area able to care for her, and with her inability to care for herself, Mrs. B died – a victim of the horrendous heat wave that hit the Delaware Valley with record temperatures. The cause of death: dehydration. The story is so sad because this death could have been prevented. 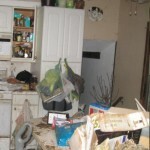 However, the out of town family members were unaware of the ongoing problem for many years. And, when they did find out, they simply did not know of the available local resources that could have provided Mrs. B with the care she needed. 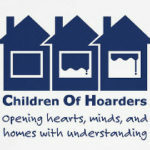 As part of our ongoing effort to provide help for families of hoarders by connecting them to the services they need, we are providing a partial list of local resources available in the Delaware Valley region that specialize in assisting seniors with self-care. Good-bye Mrs. B. May you rest in peace. 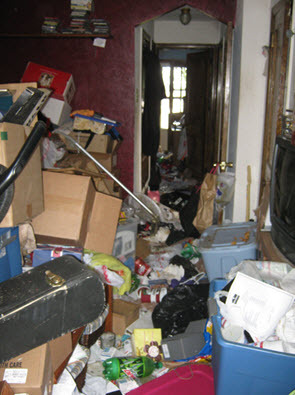 We provide compassionate help for families of hoarders in the Greater Philadelphia and Southern New Jersey region faced with the crisis of clean up. However, if you know of other senior care resources in the Greater Philadelphia and Southern New Jersey area who would be willing to help people like Mrs. B, please contact us by phone at 877-750-7876 or email at hallcroft@puroclean.com and we will add them to the list.